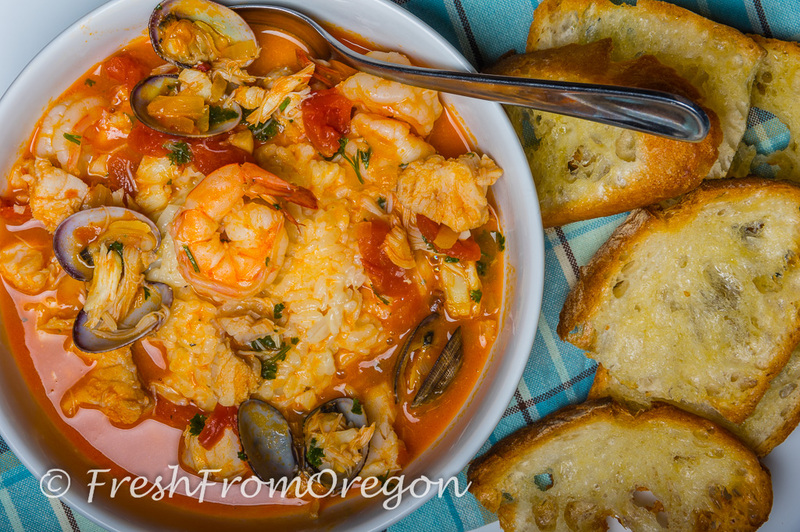 Fresh from the Oregon Coast ~ Cioppino for Two! Dungeness crab is still Fresh from Oregon with some other great seafood like Ling cod, Rockfish and Petrale Sole. The peak season to find Dungeness crab in Oregon is December through April and fresh ‘whole-cooked’ crab are readily available on the coast, farmers markets and supermarkets. If buying at the farmers market expect to get the whole cooked crab that will still need to be cleaned. 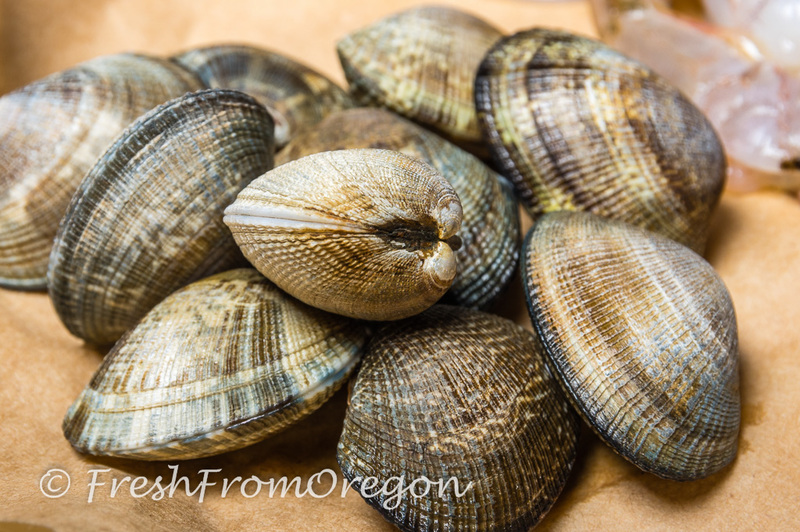 If you want to skip cleaning out the insides you can buy and ask your local seafood store or supermarket to clean them before you take them home. I bought mine at the farmers market and yes I had to learn how to clean a crab. 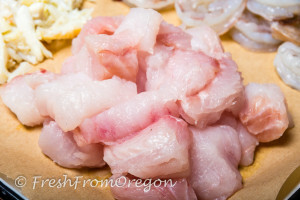 With some help I found on the Oregon Dungeness Crab Commission website they had a great video that helped me through all the steps and it was not so bad cleaning it myself. My husband’s favorite seafood dish is cioppino and he has had many bowls from all over the pacific northwest. 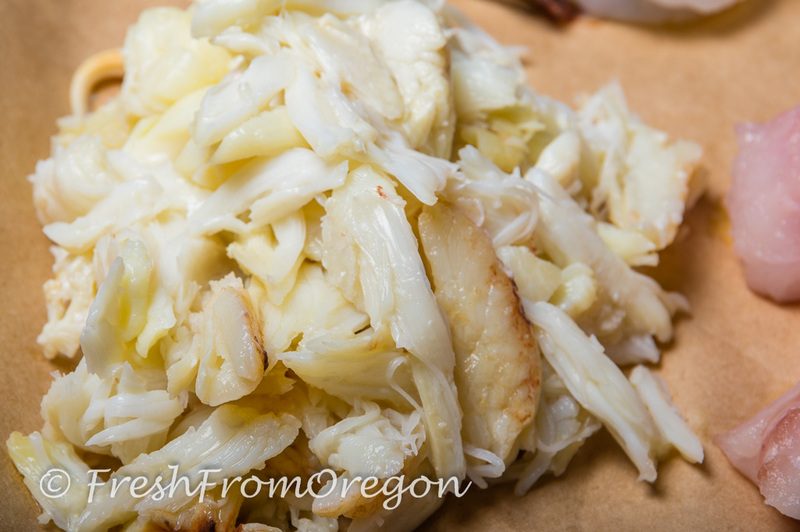 This was a dish I wanted to make at home for him so with my one whole Dungeness crab and fresh Ling cod from the farmers market I started collecting my seafood. 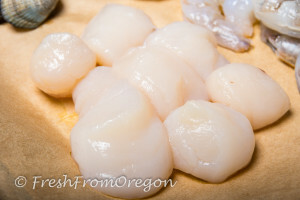 With a stop at the local supermarket I added fresh scallops, shrimp and Manila clams to my first homemade Cioppino. So what is Cioppino and where did it get started? 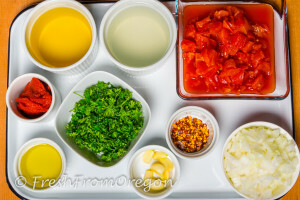 Originating in San Francisco it is a tomato base fish stew and is considered an Italian-American dish. It has been said that as the fisherman came in for the day from fishing they would “CHIP IN” to a pot of cooked tomatoes, wine and spices thus creating the name Ciopinno (chip-EEN-o). Since the catch of the day could be anything the stew could be different each day. 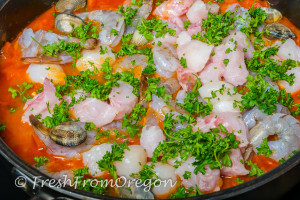 So as you are making the Cioppino add the seafood you like and each time you make it try a different combination. The recipe below is for two and uses just over 2 pounds of seafood. 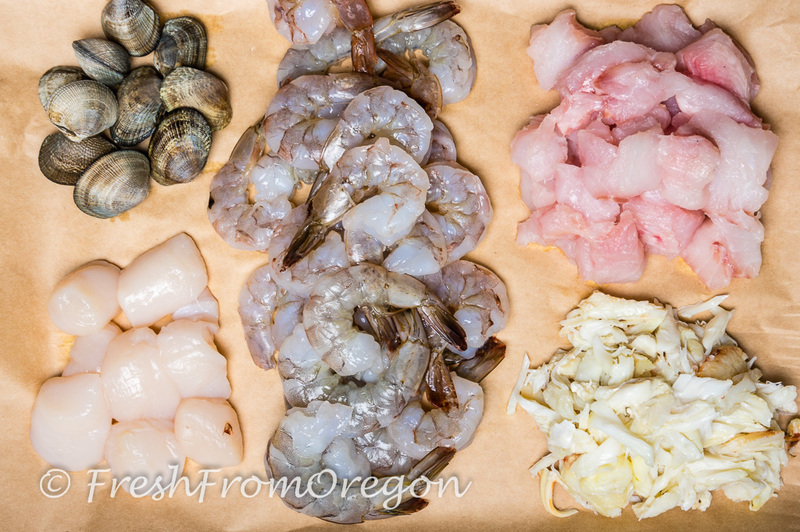 I choose to use Dungeness crab, Ling cod, shrimp, scallops, and Manila clams. Some other seafood you could use would be little neck clams, mussels and squid. 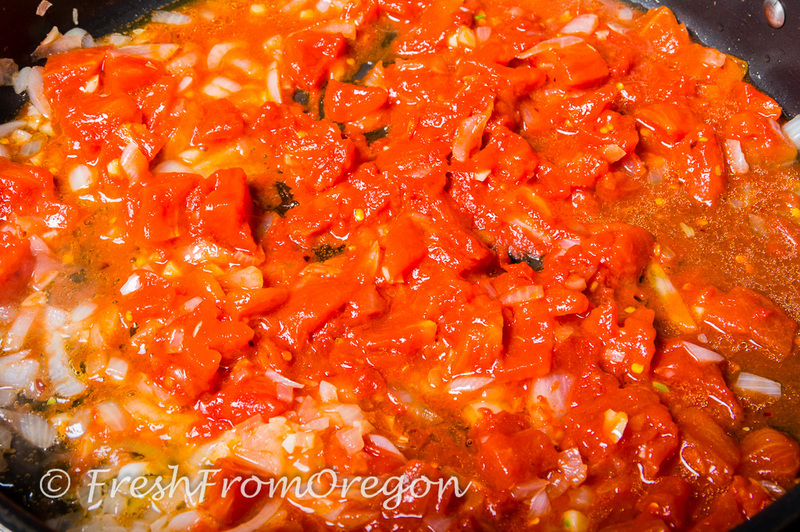 I wanted to add my own twist to my Ciopinno so I served it over my creamy Parmesan risotto. 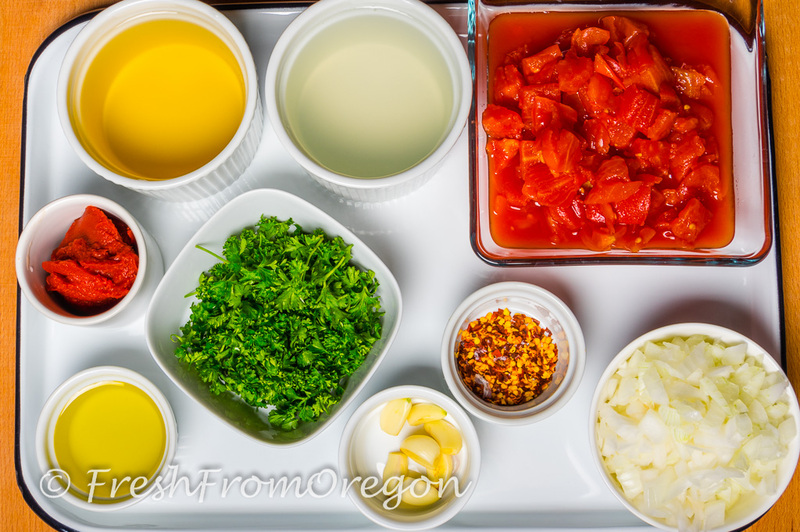 This made the broth rich and creamy and a full meal for me and my husband. Enjoy my version below and enjoy some fresh seafood from where ever you live! Heat the olive oil in a large, deep pot over medium heat. Saute the garlic and onion until they become aromatic, but not browned. Add in the diced tomatoes, tomato paste, and chili flakes and continue to stir for about 1 minute. Pour in the white wine and water and simmer on low heat. Cover and cook for about 30 minutes. Turn the heat up to high and add in the all the seafood and the parsley and gently stir together. As soon as the clams and mussels are open, the stew is ready, this will take any where from 5 to 8 minutes. Add salt to taste and serve immediately. In a large bowl place a cup of the hot Creamy Parmesan Risotto* and spoon broth and seafood over the risotto. 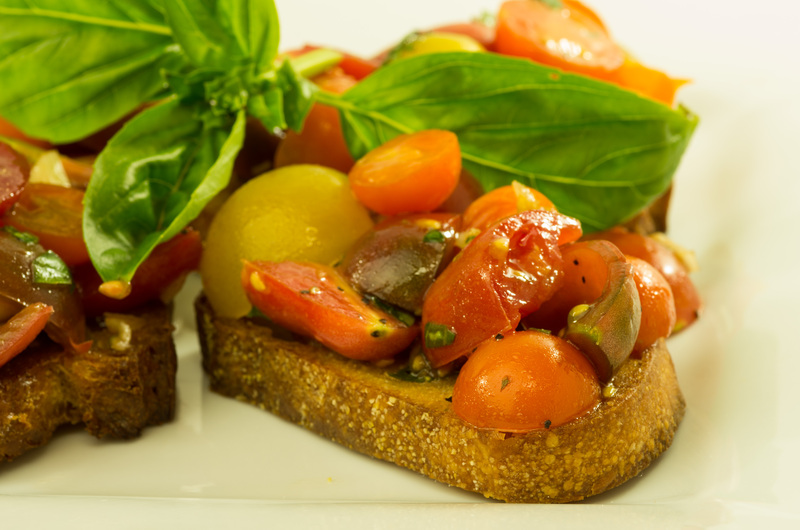 Serve with toasted crusty bread. This makes two hearty portions with the risotto added so you can make this dish to serve 4 people just as easy. Bring chicken broth and water to a boil in a saucepan. Reduce heat to simmer. 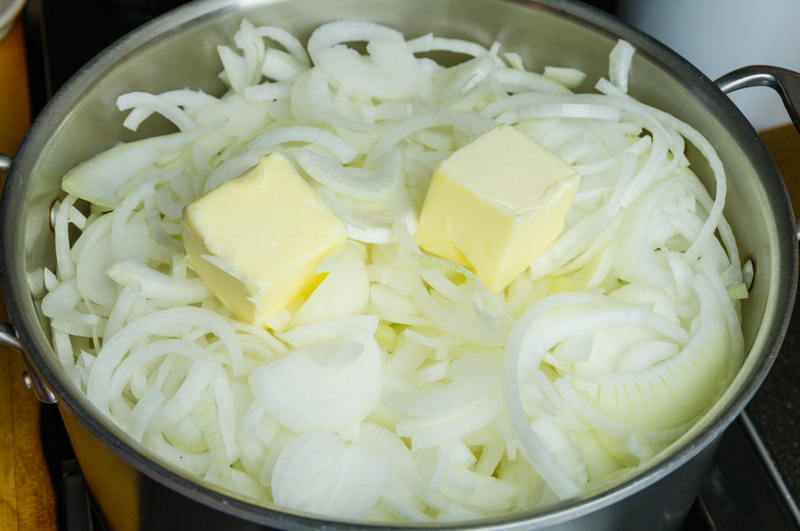 Melt 2 tablespoons butter in a large saucepan over medium heat, add onions, and saute until tender about 3- minutes. Add dry rice and saute for 2 minutes. Add wine and cook, stirring constantly, until liquid is absorbed. Add 1 cup of the hot broth mixture and cook stirring often until liquid is absorbed. Add another cup of broth and repeat procedure, adding remaining broth 1 cup at a time. Cooking time is about 25-30 minutes. Once the last broth has been added and liquid absorbed add the butter, whipping cream, Parmesan cheese, pepper and salt. Cook, stirring constantly for 2 minutes, serve immediately. 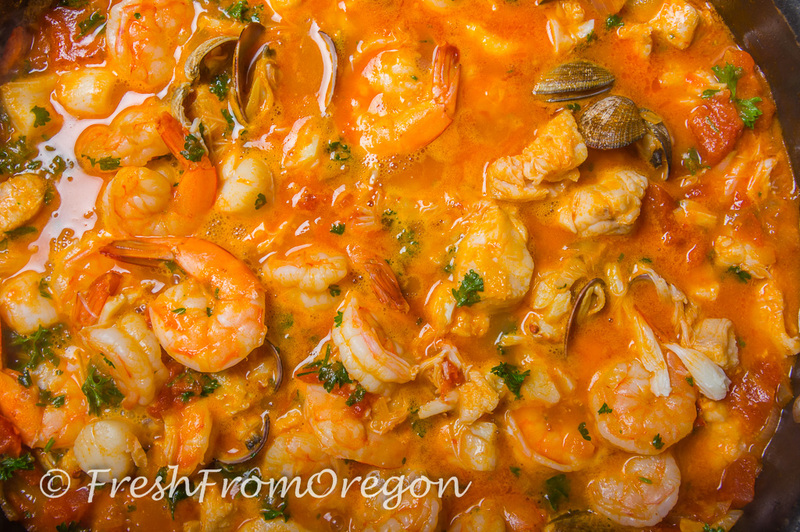 If you want to save time cook the day before or just before starting the Cioppino. Reheat before serving with the Cioppino. Capay Valley Ranches ~ California Olive Oil at its Best! Mini Apple Hand Pies are perfect for the Lunch Box! 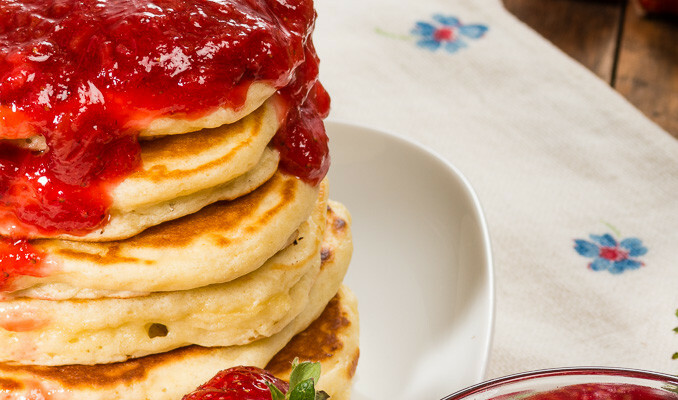 Bays English Muffins perfect for your Lunch Box! 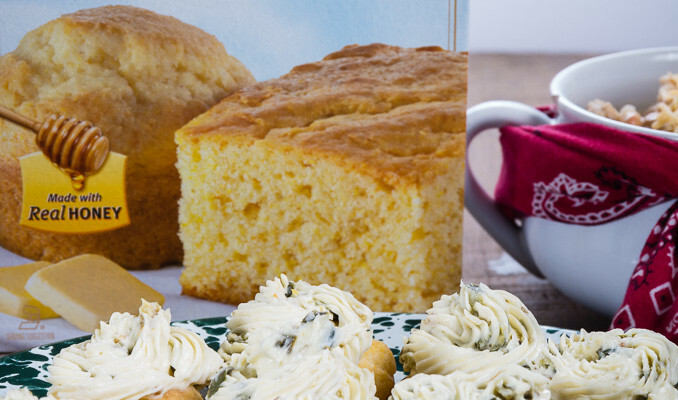 Dutch Apple Pie ~ Just the right bite! 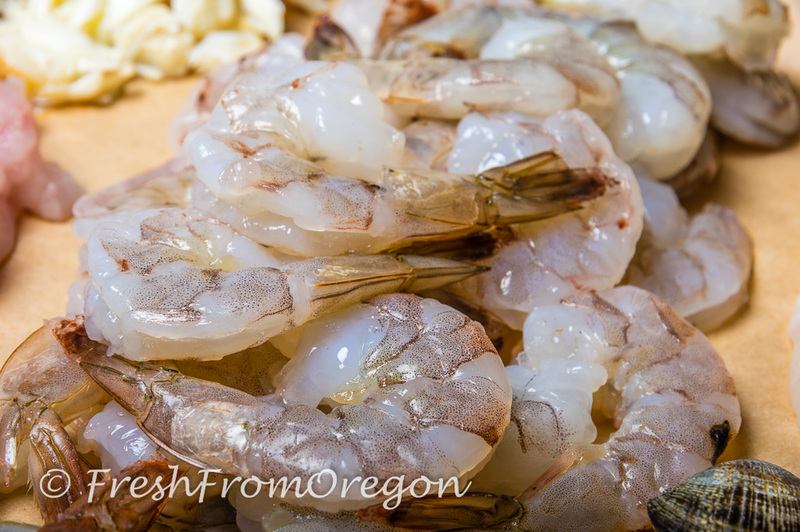 Experience fresh food from Oregon!